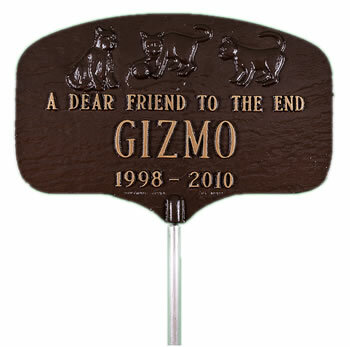 This cat memorial marker is made of recycled aluminum and measures 6.75" W x 10.5" L. The marker includes a 12" stake that is attached with a screw. 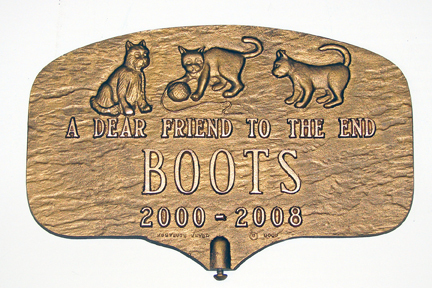 Top line says "A Dear Friend to the End". Made in USA. I rescue cats and sometimes it is too late. The poor things are sometimes too weak to survive by the time i find them. 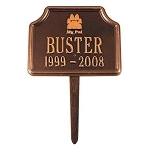 I found OurCornerMarket about 3 years ago and have ordered 9 of these from them over the years. Two of them were for my cats that died of old age. Unfortunately, this time two of my babies didn't make it. 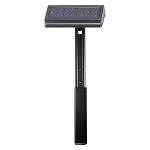 So I'm ordering 2. 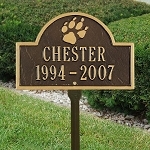 The plaques are beautiful in my pet memorial garden. And, I love it that I can talk to someone. They know me too.